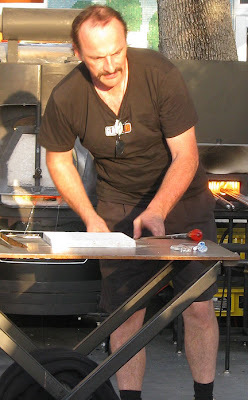 Meet Louis Olson, glass artist, glassblower, batch engineer and marketer, annealer maker and marketer and all round the most energetic person I have met in recent past. Louis is Noslo Glass. Louis was with the GlassLab in Miami--working with the celebrated designers to help them work out their designs and realize their design intentions. And, I had a chance to talk with him over a few dinners and lunches, poolside and on his birthday. If we weren't talking to Louis directly, we were talking (with amazement) about Louis. He runs his own glass business, didnt like the glass batch offered in the market so he started to make his own. Now he does that in addition to glassmaking-- he makes and sells batch and also annealers (the GlassLab has one of Louis' and it is excellent according to the team). When he isn't working, he is playing equally hard. When we were all snug in our beds, Louis found the hottest spot in Miami and was entertained by salsa dancers on the bar and the scene. He got into his snug bed around 3 a.m. to be fresh and ready to go when the rest of us, the slug a beds were rousing. He is an inspiration and a good sport. Whenever we went out with him, we made every night his birthday...and he played along...to our howls of laughter. Louis is amazing, intuitive and inventive. Plus, Louis has some very good ideas and concepts. His brain is always working. Why do I introduce you to Louis? Louis saw my Memento Mori notebook while we were in Miami and suggested we get together and make some forms in black glass and sandblast the illustrations (probably reversed--per my new knowledge from Steuben) into the glass. That would make the whites matte and white and depressed into the glass (slightly) and the blacks shiny and slightly raised. Or, what if you worked in clear glass (say a flat bottle) with the front plane and back plane interacting in an interesting way? I think that is a very cool idea and plan to pursue this. Why not? Matt Haber (of the other night's conversation about Mark Murphy) has bottles ( Lambrusco or some cheap stock bottle) painted. I can design the bottle or vessel, do the move (that is 3 D art direction with a glass team) and provide illustration etc. Maybe introduce some sewn or woven neck treatment in the case of a bottle. Or maybe, to keep it simple, just huge spun out platters/rondelles to get the illustration up big? I could see what happens. If good things happen, do more-- and maybe enter them into New Glass Review (remember, get the work out there? )...and work until it gets boring...or too much time/money is burned in the experience. I think there could be a market for this stuff (even for the Ithaca Art Trail etc.). New Year promises new avenues.